Ken Conley is getting ready for the 2009 Tour of California (and yes, I’m bursting with jealousy), and posted a couple of shots in preparation. 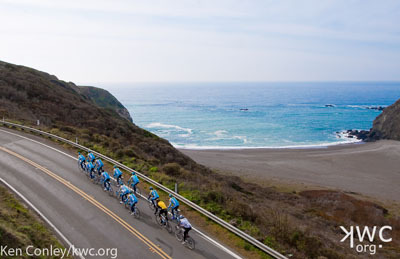 Above is a beautiful shot of the Astana team training along the coast. It’s a cycling photography staple, but one thing immediately caught my eye: There’s one guy who, visually, doesn’t belong. I’m talking, of course, about 7-time Tour de France winner Lance Armstrong, who is riding here in his Livestrong kit (possibly on his Livestrong Madone), while everybody else flies the Astana flag of the team sponsor. Now obviously, once the Tour of California starts, Armstrong’s going to be wearing the cornflower blue, corn yellow, and white of his team. And maybe there’s another reason Armstrong came on this ride in his Livestrong livery – a photo shoot or an event. But looking around the web, it looks like this may be a planned marketing direction, with Armstrong promoting his Livestrong Foundation rather than the team’s ostensible sponsors. For me, that feels a little weird. When we’re trying to explain bike racing to newbies, we always begin and end with, “One guy takes home the trophy, but this is a TEAM sport. Everybody’s got a part, and good things happen when everybody does their part.” It seems like it sends the wrong message to have one guy who is out of uniform and so clearly has goals outside of the team’s. It’s going to be interesting to see what happens when we get down to racing.